Finally, the much-awaited master plan for Haridwar has been approved, and in the coming years, the city will get a major facelift, which will be in sync with the world’s renowned religious-spiritual-tourist tag attached to it. The Communist Party of India (CPI), the Communist Party of India (Marxist) and the CPI (ML) have joined together to fight the ensuing Assembly elections from one platform with a joint appeal and election campaign. Members of the Christian community and students from Nirmala Inter-school participated in a traditional cake-mixing ceremony that is considered as preface to Christmas at a local hotel here today. There has been a decrease of 6.3 per cent in the overall crime rate in the state as compared to last year. As per statistics released by the state Police Department, a total of 6,968 cases under the IPC have been registered in 2011 while the number was 7,455 in 2010. Before the forthcoming Assembly elections, the much awaited musical album (video) of renowned Uttarakhandi folk singer Narender Negi, which highlighted corruption in higher places and political satire, was released here today. The ONGC made a clean sweep in the men’s category in the 31st Petroleum Sector Sports Promotion Board (PSPB) Tennis Tournament. 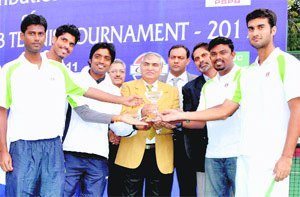 Yuki Bhambri and Vishnu Vardhan, both of the ONGC, were declared joint winners. Sundar Lal, Executive Director, Chief Employee Relations, ONGC, gives away the prize to the winning ONGC team in Dehradun on Friday. The Uttarakhand Power Corporation Limited (UPCL) has expressed its inability to electrify 24 localities in snowbound areas of Munsiyari and Dharchula subdivisions in the district. Workers of the BSP staged a dharna at the district headquarters demanding the reopening of Magnesite Factory in the Chandak area of the district and jobs for the youth of the hills in the SIDCUL industrial area. Under a new initiative launched by the Election Commission of India as part of monitoring the election expenditure, a folder of evidence will be created that would keep an account of the funds used by the candidates during the election. About 50 pugilists will participate in all 10 weight categories of the Central India Zonal Senior Women’s Boxing Championship to be organised by the Dehradun District Sports office at the Parade Ground from December 11 to 13. Dehradun District Magistrate Dileep Jawalkar addressed the district officials, members of various NGOs and mediapersons here today, urging them to make united efforts to spread awareness among people to exercise their voting rights. As part of its campaign against corruption, the Akhil Bhartiya Vidhyarthi Parishad today held a convention followed by a protest march in Dehradun. Addressing a gathering at the Pavilion Ground, ABVP national general secretary Ummed Dutt Sharma called upon the youth to come forward to fight against corruption. A government order has been released for the creation of new districts of Kotdwar, Raniketh, Didihaat and Yamunotri. Tourists extended their stay in anticipation of a snowfall as the upper air cyclonic circulation and western disturbance active in the state resulted into fresh spell of rain showers accompanied with heavy thunder squall in the here today. Pakistani actress Veena Malik, who shot into the limelight in India by being part of a television reality show, has come under fire from Muslim clerics and several organisations in Haridwar too. Members of the Uttarakhand Kranti Dal (Panwar) yesterday met Senior Superintendent of Police (SSP) GN Goswami and demanded action against Circle Officer (City) Mani Kant Mishra for ordering a lathi charge on their the activists of the party when they went to submit a memorandum regarding the reinstatement of trainee constables to the Director General of Police. A person was killed and his wife was injured seriously when their van plunged into a deep gorge on Kailakhan road near Bhawali on Wednesday. Notably, the previous master plan of the city got over in 2007 and since then it was only being given further extension. But now this 2011 master plan has been proposed keeping in mind the 2025 requirements of the city, taking into account various parameters. Haridwar Development Board(HDA) vice-chairperson Chandra Sekhar Bhatt said that with the master plan coming into effect, the development of the city will be done in a planned manner. He added that under the new plan, regularisation of irregular colonies and compounding of commercial establishments being operated in areas coming under residential zones will also be carried out. Also, the illegal constructions that had mushroomed in the city in the past few years would come under scanner, and it would be impossible to build such structures now. With the implementation of the master plan, the revenue of the HDA, said Bhatt, would also increase manifold as dozens of illegal colonies would be now regularised and tax taken from them. Simultaneously, those old residential colonies which had been categorised commercial in this plan would also be paying fees in case they wanted to commercialise them, he added. Anil Tyagi, working secretary of the HDA, pointed out that with the implementation of the master plan, they would be having a separate land bank, which would come in handy when public schemes, projects or for other such purposes land is required. “Educational, commercial and residential areas will be earmarked separately, paving the way for an organised, legal development of the city,”added Tyagi. Local residents have welcomed the step, terming it a landmark for the city as besides Haridwar being a world renowned pilgrim city, it has become a fast growing industrial hub in the northern region. Sudhir Mehta, general secretary of the SIDCUL Industrial Association of Haridwar, expressed happiness that now the city would be living up to its international level, and with the upcoming international airport and master plan development, Haridwar would be one of the prominent cities in terms of residential and commercial aspects. He also said it was important to turn down those policies of the Centre, including the FDI in retail, which pushed the country to slavery under foreign powers. Raja Bahuguna, state secretary of the CPI (ML) rued that the state government could not spend the entire fund under the Special Component Plan meant for welfare work for minorities in the state. Before the forthcoming Assembly elections, the much awaited musical album (video) of renowned Uttarakhandi folk singer Narender Negi, which highlighted corruption in higher places and political satire, was released here today. Music lovers in the hill state were anxiously waiting for Negi,s "Ab Kathga Khailo" since a long time. A few months ago, it’s audio was released and it evoked warm response from all quarters. The video of “Ab Kathga Khailo” was released by State secretary of the Communist Party of India Samar Bhandari at a hotel in Dehradun. Before the 2007 Assembly polls, Narendra Singh Negi had come up with “Nauchammi Narayan”, a video album depicting the corruption prevalent during the previous Congress Government led by Narayan Dutt Tewari. The album was a runaway success and was used by political rivals of the Congress during the last Assembly polls. The shooting of this album took place in various locations in Dehradun and Pauri districts. Directed by Anil Bisht, the leading artistes in the new VCD are Ghananand, Vimal Bahuguna, Rajesh Joshi, Harshpati Rayal, Madan Duklan, Rakesh Gaur, Ajay Solanki, Kabilas Negi, Yatendra Bahuguna, Mukesh Sharma, Abu Rawat, Beena Rawat, Richa, Neelam Bisht and Shivani Rana. Usha Negi is the dress designer and Ravi Bhatt the cameraman. A presentation of the Himalayan Films, the title song -”Commission ki meet-bhaat” - is a satire on the functioning of the top brass of the Uttarakhand Government involved in making money through commissions. Right from Maha Kumbh-2011 and th Citurgia land scam, all figure in the song. The folk singer also makes a sharp attack on the supporters of political leaders acting as agents. “Machu pani paindu” is the second song on corruption in the album and it points at lower office-level corruption. Another attraction of the album is a duet by father and son. Narendra Negi's son Kabilas Negi (an MBA graduate) makes debut. The father-son has teamed up for the first time to sing “Apuru see dikandu che,” a song on highlanders preferring to call themselves natives of Dehradun rather than the hills. The psychology of many young Uttarakhandis, who hate being called a pahadi, is minutely captured in the song. “Mayadar” is a Sufi song, while “Rupako jadu” and “Main tho suni tera gaon maa” are the two love songs in the album. Students from Nirmala Inter-school participate in a cake-mixing ceremony in Mussoorie on Friday. Earlier, Sister Hilda, Sister Roselyn and Brother Edward from St George’s College, offered prayers to the lord and gave blessings to the community members. Students from Nirmala School enjoyed the ceremony. This will be stored till Christmas to prepare a 100-kg Christmas cake. The general manager of the hotel Anil Sharma said the cake-mixing ceremony held here was the first step to usher in the Christmas festivities and was believed as the forerunner of good things, happiness and peace. He further said keeping with the tradition of corporate social responsibility, schoolchildren from the lower strata of society were also invited to the ceremony. There has been a decrease of 6.3 per cent in the overall crime rate in the state as compared to last year. As per statistics released by the state Police Department, a total of 6,968 cases under the IPC have been registered in 2011 while the number was 7,455 in 2010. In all, 5,733 cases have also been resolved in 2011 which is to say that the police encountered success in 82 per cent cases registered in the current year. A system is being developed to ensure an effective clampdown on criminals engaged in immoral trafficking and trade. In order to deal with the menace, two anti-trafficking units have been established in Dehradun and Banbasa, which are functioning in association with the Special Task Force (STF). The units have been equipped with communication, manpower and other necessary facilities. According to a report on crime and law and order situation in the state in 2011, a Five Year Plan from 2011-12 to 2015-16, for the modernisation of the police force has been prepared and sent to the state government as well as the Government of India. A special drive is being conducted in the entire state from time to time to check crimes. Giving details of various steps being taken for checking crime in the districts, Crime Seminars are organised in districts every month in which the police conducts a thana-wise review of the actions taken for an effective control of crime. In order to deal with criminal activities, standard operating procedures (SOPs) have been prepared in accordance with the strategic and geographical situations in the state. Separate sets of the SOPs have been prepared with the view to deal with any type of terrorist activity by carrying out an assessment of the present security-related scenario of sensitive and important institutions of the state. A rehearsal of the procedures is carried out from time to time. A core group has also been constituted which is into studying the schemes, operating procedures and updating them. The following are the results of the finals of the tournament. Winner- Indian Oil Corporation Limited (IOCL) represented by manager Manjusha Kanwar, Tejbir Singh Bhandari, Vivek Satyajit, RS Bhist, JP Janakan. Runner-up: IOCL represented by manager Manjusha Kanwar, Sunil Kumar Sipaeya, Divij Sharan, Kaza Vinayak Sharma, SV Abishek and Mohit Mayur. Third position: OIL represented by manager Pradeep Rajbankshi, Hakim Ali, CS Mohanty and Anshuman Dutta Both Yuki Bhambri and Vishnu Vardhan were declared the player of the tournament. However, Yuki Bhambri declared that Vishnu Vardhan deserved it more for having won three titles in the tournament. The prizes in the men’s category to the winning team, the runners -up and the third position winner were given away by Sundar Lal, Executive Director, Chief Employee Relations, ONGC, at the prize distribution function held at the ONGC Tennis Facility here today. The Uttarakhand Power Corporation Limited (UPCL) has expressed its inability to electrify 24 localities in snowbound areas of Munsiyari and Dharchula subdivisions in the district. According to sources in the corporation, the localities having less than five families could not be provided with electric poles on the corporation’s expenditure. “The number of such localities in the district is 32, including 11 in Johar valley and 13 in Darma and Vyans valleys in Dharchula sub-division of the district,” said Narendra Tolia, Executive Engineer, Uttaranchal Power Corporation. The snowbound villages of these valleys don’t have grid lines therefore can not be linked to the grid. “These villages have been handed over to Uttarakhand Renewable Energy Agency for the installation of solar or wind energy-based power plants there,” said Tolia. Besides the valleys in the high Himalayan range, there are eight small localities in the lower valleys as well as in Berinag, Kanalichina and Gangolihat blocks. “Out of total 1,566 villages of the district, the Uttarakhand Power Corporation has provided electricity supply to 1,511 villages, and the responsibility to provide electricity supply to the rest of the villages has been given either to the Renewable Energy Department or to the Micro Hydroelectric Department,” said Tolia. “When the BJP had come to power in 2007, it had promised jobs for the youth of the hill areas in SIDCUL factories. It had also given an assurance regarding the reopening of the factory. However, nothing has been done so far,” alleged Arjun Prasad, district coordinator of the BSP. “There are more than 1 lakh persons living in 243 villages of the district. However, none of the village has got benefits of schemes being run under the special component plan. No construction of bridges, hospitals, drinking water schemes and school buildings has take place,” Prasad added. The party workers also demanded that the land which had been earmarked by the former Congress government for the construction of Ambedkar Bhawan should be given to them so that they could get construction work start. “Though the government has sanctioned Rs 38.46 lakh for the construction of the bhawan, due to non-allocation of the land, construction work could not be started,” he said. He further added that they had also submitted a memorandum to the District Magistrate in this regard on December 5, but to no avail. Prasad said they would not end their agitation till their demands were met. At a media sensitisation workshop organised today by the Chief Election Officer for Media, this information was given. “The folder of evidence will comprise video and audio CDs, posters, books, pamphlets, clippings of paid news and advertisements as appearing in newspaper notices issued by the Returning officer regarding expenditure, and even FIR. These would then be used to tally the expenditure incurred by the candidates,” said Radha Raturi, Chief Election Officer (Uttarakhand). Besides, the CEC would also depute senior officers of the Government of India as election expenditure observors for each district. The Chief Election Commissioner has issued guidelines for star campaigners under the People’s Representative Act 1951 section 77 (a). The expenditure incurred on star campaigners while campaigning for their candidates, the expenditure on their stay, food, lodging etc would be included in the total expenses of the candidate. Sanjay Gunjiyal, DIG (Garhwal Range), also the president of the organising committee, said here today that boxers from Uttarakhand, Chhattisgarh, Madhya Pradesh, Delhi and Uttar Pradesh would compete in the three-day event. He said the bouts would be conducted everyday from 3 pm onwards. The event would be inaugurated by state Sports Minister Khajan Das at 2.30 pm. Dharmendra Bhatt, District Sports Officer, said the medical check-up of the competitors would be conducted everyday at 7.30 pm and those found fit would be allowed to contest. Bhatt said the central zone women boxing team would be selected from this event to represent in the Inter-zonal Senior National Women Boxing Championship scheduled to be held at Pondichery from December 21 to 24. He said during the event, a ‘star one’ examination for the referees would also be conducted. percentage was an issue of concern. He said the vote percentage of the city was 58-76 per cent while of the state as a whole was 63-72 per cent. He said there were almost 10 lakh voters in the city out of which 1.21 lakh voters have applied for the voters list this year. He asked various education and sports institutes to encourage youngsters in the age group of 18-21 years to come forward to give their names for the voting cards. He said the returning officials should make arrangement for the employees engaged in the election work to cast their votes. He said a policy had to be devised to train people. As part of its campaign against corruption, the Akhil Bhartiya Vidhyarthi Parishad today held a convention followed by a protest march in Dehradun. Addressing a gathering at the Pavilion Ground, ABVP national general secretary Ummed Dutt Sharma called upon the youth to come forward to fight against corruption. He said it was the biggest issue affecting the country today. He also called for collective struggle to bring back blackmoney stashed away in foreign banks. Youth Against Corruption leader Sunil Bansal, who also participated at the convention, said political parties must observe transparency in their works. He said parties must also be made accountable for the funds utilised by them. “We plan to organise many more anti-corruption rallies in the country,” he added. 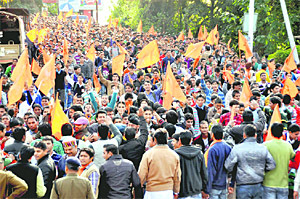 Later, the ABVP members took out a march against corruption. The nod for the same had already been given by the Uttarakhand Government at Cabinet meeting last month. The announcement of the creation of the districts was made on August 15 this year by former Chief Minister Ramesh Pokhriyal Nishank. Principal Secretary and Revenue Commissioner PC Sharma said the government had not taken any decision for declaring the district headquarters for the new districts and the appointment of SSP and DMs and carving of the boundaries would also take place after the Assembly elections. Sources claim the government decided to play it safe and issued a government order instead of a notification, as it would have been difficult to amend the notification in the future. The tourists and residents alike huddled in anticipation of heavy snow since morning. The sky, however, cleared in the afternoon, disappointing the visitors. The fresh winter rain has brought smile to the faces of farmers who were waiting for the dry spell to end in order to sow their crops for the season. The apple belt farmers also said the fresh dip in temperature would help in nourishing the apple trees in the region and if the condition remains the same, it could also result in good yield in the coming season. The Meteorological Department was of the view that the climatic conditions would remain the same for the next couple of days accompanied by rainfall and snow in the higher reaches of the state. Members of the Uttarakhand Kranti Dal (Panwar) yesterday met Senior Superintendent of Police (SSP) GN Goswami and demanded action against Circle Officer (City) Mani Kant Mishra for ordering a lathi charge on their the activists of the party when they went to submit a memorandum regarding the reinstatement of trainee constables to the Director General of Police (DGP). Gowami told them that it was not under his jurisdiction decide on suspension or action against Mishra. He was merely an inquiry officer and would submit the report to the DGP soon. The district president of the party said they would await the inquiry report and if no action was not recommended against the officer then they would launch a dharna. “The dead has been identified as BC Pandey, an engineer with the Military Engineering Service, who was going to Birla Mandir school in ainital to meet their son studying there. The vehicle plunged into gorge late night but the information could reach the police in the morning,” said Rahul Rathi a police officials.